Newspaper Strips make way to iPhone Apps. Mark Waid of Boom Comics Jump’s ship to go into independent digital publishing. ACT-I-VATE to raise money for Primate Rescue Centers with Panels for Primates. Overview of where the direct market went wrong. Print comic disables comments from web version, because they are too racy. Apps may make it impossible to find new comic or to build a following. Dylan Horrocks Promotes The Pirating Of His Work, Pickle. 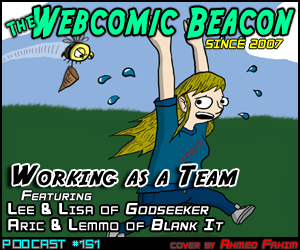 Lee & Lisa (Godseeker) and Aric & Lemmo (Blank It) join Fes to discuss working as Writer and Artist teams. Apologizes for the varying audio quality. Cover Art by: Ahmed Fahim (Antisoshell). Be sure to check out all of our guest/fan art! 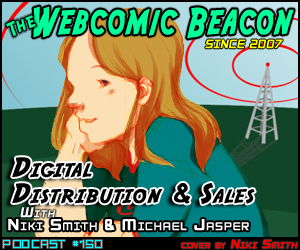 Niki Smith and Michael Jasper (In Maps and Legends) joins Fes and Mark to discuss digital distribution and selling comics as eBooks. Niki and Michael had won a Zuda competition and had a few chapters published online with them before Zuda went under. They then made their way onto Comixology and others. Diamond making a move towards digital distribution. Pros saying that conventions aren’t worth it anymore? The Adjusted, and it’s multi-online device comparability & distribution. Ron Perazza (Zuda) promoted to VP of Online for DC Entertainment. ComicPress, Comic Easel, and Frumph. Ryan Estrada’s 1-month Animated Feature. 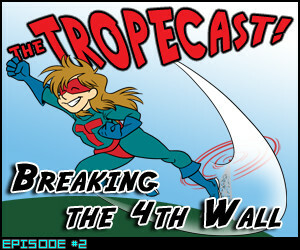 In this Tropecast, Jules Rivera (Marsh Rocket) joins Adam and Alex to discuss the trope Breaking the 4th Wall! Mainly as a basic introduction to the basic forms of breaking the fourth wall, complete with examples. This is a simple idea, but can expand into a multitude of additional points of interest and discussion (of which we’ll save for later!). 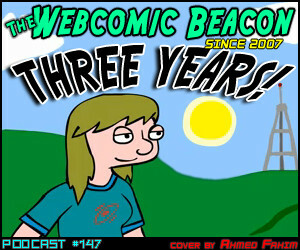 Fes, Tanya, and Mark, are here to celebreate THREE YEARS of THE WEBCOMIC BEACON! We are also joined by two of the new TWCB crew, Adam and Alex! 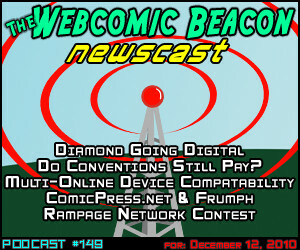 We attempt to talk talk about webcomics.. pffft HAHAHA! No we don’t try too hard, but we have a lot of fun on this episode, talking about whatever! Thanks to all who have contributed to the show and listened to the show! Cover Art by: Ahmed Fahim (Antisoshell). Be sure to check out all the art we’ve received over the years! Help us put together a room party for Penguicon 2011! Please consider buying a sponsorship for the show. $20 for Core Episodes, $10 for EPs or Newscasts. Donate or sponsor $50 worth, and we’ll specially design a drink based off of your webcomic name. Rosscott and Alex Heberling are joined with Fes for this edition of the Webcomic Beacon Newscast! We also have newshound Eric/Drowemos to thank for snooping out stories. 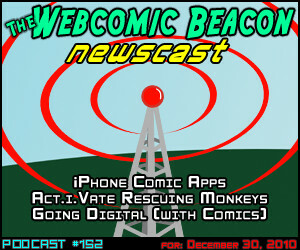 We talk a bit about Comixology signing independent comic creators, to utilize their digital comic distribution system. They have a self-authoring sign-up on their website. Also, as reported on The Anime News Network, many Manga publishers are starting to go the digital distribution route. A great amount of research has been done by George Rohac, with his Master’s Thesis on Copyright and the Economy of Webcomics (with additional commentary on Fleen). 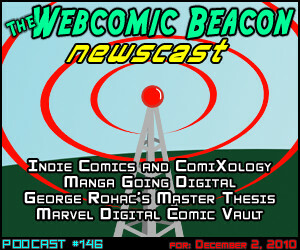 Also, we discuss Marvel’s “Digital Comic Vault”. Book Releases: Girls with Slingshots vol 5, Webcomics: What’s Cooking? Kickstarter.